Jen Nadol offers readers a romance with big stakes and an ethical dilemma with no easy answers in this riveting sequel to The Mark. Paranormal fans who love the psychological thrill of Lisa McMann's bestselling Wake trilogy will flock to these books. This book is the sequel to her first book which was called "The Mark". And I must admit that I actually liked "The Mark" better than I liked this one. This one left me confused. I guess maybe with book three coming out next year, it would probably help me understand it more. Cassie has this special ability to see glowing mark around someone who is on their last day on earth. In other words, she can tell when someone is going to die. And she was hoping to find others like hers. But you'll never know what you'll find when you're searching for something you're not so sure of. While making new friends and having an odd job, she gets the attention of the hottest boy in school. He wants to be with her and basically he's claimed her. But he has his own reasons behind wanting to be with her. And soon, Cassie discovers exactly what she's looking for. But the question is, she really ready to face that what she believes in is not exactly other people's beliefs? Because although she finds Zander, (her new boyfriend) she finds something very important about him that she can't comes to terms with. Zander isn't who she thinks he is. He's her complete opposite. I personally didn't like Zander. So what do you do when two people are complete opposites? I really like Jen, Damaris and I met her at a book signing. And I swear she is the sweetest person ever. She took tons of pics and chatted with us until they basically had to close the bookstore on us. She's a blast. When I read her first book, I was hooked. I really liked the revelation of how Cassie finds out what exactly the mark means and how she handles it. But with this book I can't say I enjoyed as much as the first. Maybe because I kind of had the same expectations from her last book. But she took this one a different route. I will continue to finish the series because I have to know how it finishes. And as much as I really like Jen and I loved The Mark, I have to give this book a 3.5 stars. However, if you've already read "The Mark" then you should read this one because you get a learn more about the history of how the mark came about. I have read the Mark yet. Sounds promising enough. I might have to check this series out sometime. I loved The Mark and I'm reading The Vision soon (won it from you guys), I'm a little scared to read it now that I have heard from several blogs the same thing you say. But hopefully I will like it enough like you did to read book 3 when it comes out. Thanks for the honest review! Vivien- You should check out this series. And to further convince you. I believe that her series was picked up by WB to become a TV series. So that's something I'm looking forward to. 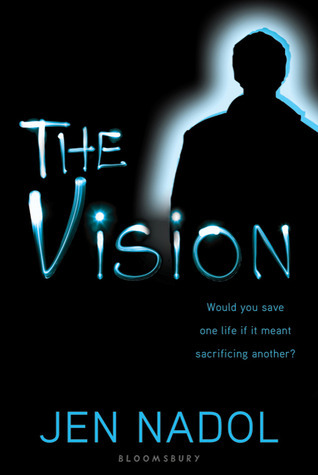 Crystal- If you loved "The Mark" you should read "The Vision". I just felt Cassie didn't really resolve anything. And Jen left me wanting more which is good, because that's what authors want to do. It comes out this month on the 27th. Right around the corner.